A contract project that I designed and developed original characters for. I also modified and adjusted existing models to extend their flexibility and use in-game. 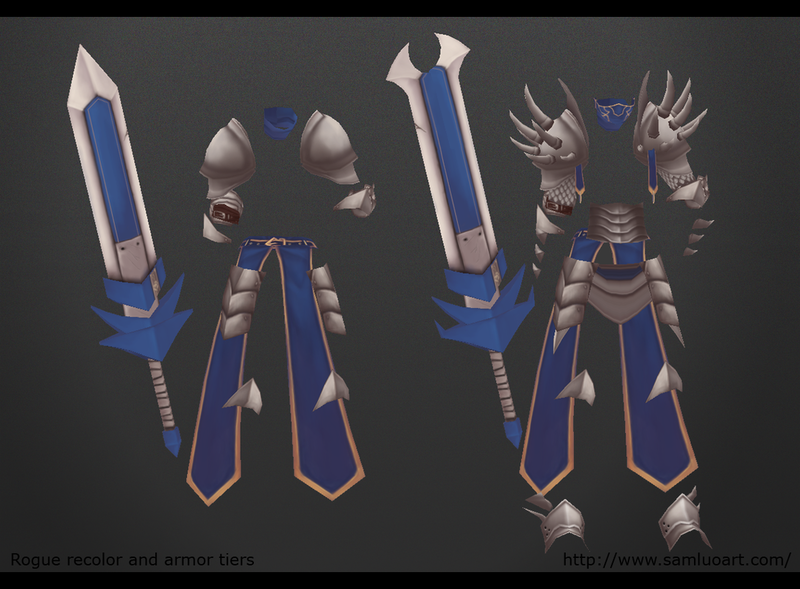 The knight character is a completely original piece I designed, modeled, and textured. He was then rigged, skinned, and set up for use with the Unity mechanim system to work with the client's existing animations. I also did extensions on the client's existing models. This is a rogue character that needed two extra tiers of armor for increasing stats, as well as texture recolors to indicate rarity, and effects. While there are 3 tiers of armor, there are 3 types of armor defined by color. There is the base color, blue, then increasing in rarity: magic, runic, regal, and dragon.